I’ve been itching to bake some cookies for the last four weeks. Not just because I’ve been craving cookies (because I certainly have been), but I’ve missed the therapeutic, relaxing magic baking works on me. Put me in a kitchen, turn on some music, and let me be in my own little baking world and I’m one happy mama. And that happens like never. Because usually I have kids “helping” or hanging on my leg, or driving trucks and trains all around me. But hey, I’ll take that too. Every once and while though, when both boys are napping I can slip into my own quiet, calm baking euphoria. It’s kind of amazing. And I got a good taste of it last week. After a hot, morning at the park both boys crashed hard. And they took an extra long nap, so I even got to sit down on the couch and enjoy a warm double chocolate zucchini cookie ( or three) while I caught up on show. That right there is an afternoon in heaven. Especially when the cookies as good as these. Double the chocolate and made with coconut oil and zucchini. That practically means they’re healthy. Gooey, fudgy and oh so chocolate-y. Eat yo’ little hearts out. 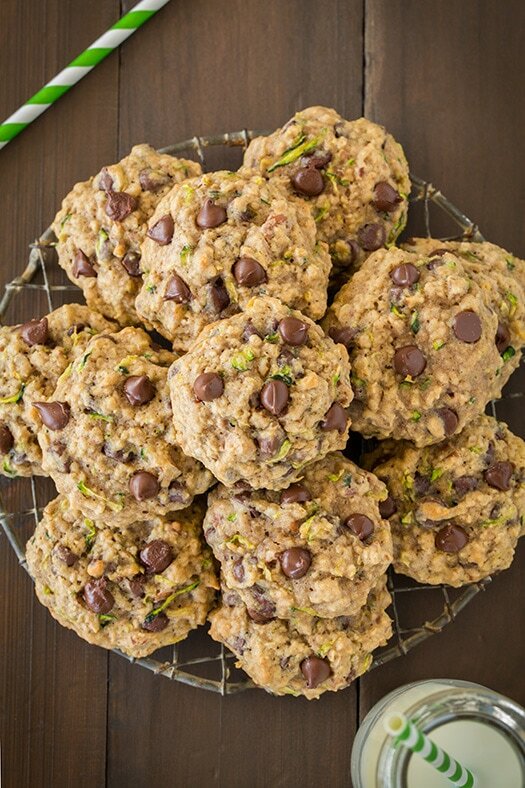 double the chocolate, fudgy zucchini cookies made with coconut oil! Preheat oven to 375. Line baking sheets with parchment and set aside. 1. In a stand mixer, mix zucchini, brown sugar, baking soda and coconut oil together until just combined. 3. In another bowl, mix flour, cinnamon, salt and cocoa powder together. Slowly mix in to wet mixture. Stir in chocolate chips. 4. Use a cookie scoop to scoop onto baking sheets. Bake for 6-8 minutes (I like to under bake mine slightly and let cool for a couple of minutes then transferring to a cooling rack). I love zucchini and chocolate in baked goods! These cookies look amazing! Just made these with my daughter. Oh my goodness, these are amazing! Great recipe! Thanks Kristy! Oh my goodness! We just made these, my kids and I are so in love <3 So yummy, and it makes the house smell amazing while baking. Serious one of the best recipes ever! Sorry, I don’t know the nutritional content for these. I don’t usually track all of that, I just try to make “healthier” choices and swaps! Those cookies were so easy to make and amazingly good. This was my first time baking with coconut oil ! I will be making them again and again. Thanks so much for sharing this wonderful recipe. I LOVE them.